The capability of GrADS to read shapefiles brings a whole new dimension to the plotting software. It provides you with a whole new range of possibilities when it comes to plotting data. With the use of shapefiles, you are no longer limited to generic maps with data plotted. Shapefiles provide you the possibility of plotting everything from county boundaries, to roads and rivers, to congressional districts, weather watches and warnings, and much more. This tutorial will give you a very basic introduction into using shapefiles in GrADS. It is recommended (not required): that you have both color.gs and cbar.gs in your script library to plot the RADAR color scale and associated colorbar. Most shapefiles I have encountered have some combination of these files, and because each shape tends to come with multiple files, I have found it useful to create a separate folder to store my shapefiles in, aptly named: Shapefiles. Now that you have the county shapefiles in your proper folder we can begin with the tutorial. The first, and possibly most important thing to know about shapefiles is that you need to plot something from your GrADS data before you can draw your shapefiles. If you don't you will get an error that says: "No Scaling Environment." So, in order to plot our counties, we need to plot a variable first, which means we will need a file. For this example we will use the RAP model using the 'sdfopen' command. Now that our data file is open, the rest of the script is very short and most of it is just setting up the domain and display options. If you have read through any previous tutorials, then next block of code will look familiar. With the domain set up, we just need to plot the variable. 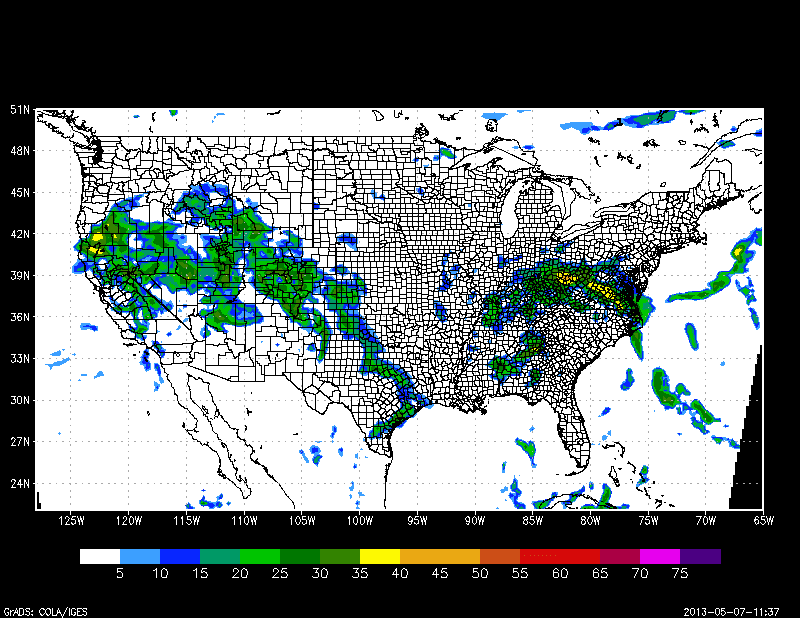 For this example, we will plot the model predicted RADAR reflectivity. I included in this block of code with a good approximation of the NWS color scale for reflectivity using color.gs. This command is all you need to draw the counties on the map. If you wish to change the properties of the shapefile you can do so using a few additional commands. The outline color can be set using the 'set line command. The fill properties can be set using the 'set shpopts' command. By default, shapefiles are not filled. 'set shpopts 15' ;*Fills shapefile, where 15 is the number of the desired fill color. A value of -1 turns off fill. Depending on your exact output options, your final map should look similar to this. Using shapefiles in GrADS can get much more complex. However, for the purposes of this tutorial, I wanted to provide a real basic introduction to shapefiles in GrADS. I may, at a later time, write up more advanced tutorials for shapefiles. In the mean time, if you are interested in learning more about shapefiles in GrADS, I encourage you to check out this resource to get a more comprehensive look. Again, you can download shapefiles for pretty much everything you could imagine, here is just a small list of shapefile resources to get you started. Why am I getting this error "SHPOpen failed"? Sorry, I've finally resolved the problem. I transferred all the shapefiles to my working directory. Okay, so a few things to check. It does not matter what folder your shapefile is in, as long as it is specified in GrADS. Really double check the path to the script, make sure your letters in the path are in the right case. Or you can just put the full path to the shapefile in your script if you are unsure of what the relative path is from the GrADS working directory. Also check to make sure you have all the right shape files (.shp, .dbf, .shx) in the folder. If these tips still don't solve your problem, send me the part of the script that calls the shapefile and I might be able to see whats wrong.